How deceiving the artwork of a CD can be. 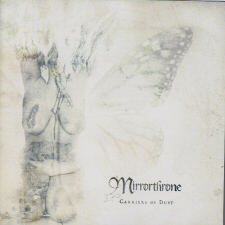 I was convinced when looking at the cover of Mirrorthrone's Carriers of Dust album that I was about to get a heavy dose of doom. For some reason it reminded me distinctly of Amorphis' Tuonela. I digress. Doom this album is not. If I had to put a label on the style, then the most appropriate would be symphonic black metal, however this does not fully explain the varied styles present on this disc. Before I continue further, I need to mention that Mirrorthrone is helmed by one man (Vladimir) which is an amazing feat considering what has been presented here. Essentially the roots of this album are based in metal but have a heavy underlying classical influence as demonstrated by the heavy use of synths. They are present at every turn and have been programmed to perfection. So many bands these days have decided to add atmosphere to their music by adding a keyboard player or programming some synths themselves only to end up totally underutilising the sound by using generic or unimaginative chord progressions that merely mimic what is being played by the guitars. Of course this type of structure works in certain situations, but if the synths are going to be a large part of your sound, then they need to occupy their own space and be allowed to flow on their own. This is exactly what has been done on this album. The keys are amazing and almost remove the need for the guitars altogether. The musicianship on this album is mind boggling. Whilst the drums and the synths have been sequenced, everything else has been performed by Vladimir with flawless precision. The guitar work is phenomenal. This guy seriously knows how to play. Think Peter Kubik from Abigor mixed with Ihsahn from Emperor mixed with whoever else you think appropriate. The guitars aren't the only thing that are performed with skill. Vladimir also holds his own in the vocal department, crossing between black metal screams, death growls and some folk inspired clean vocals at a whim. Sure he's no Garm, but the vocals on this album really are done very well. As if he hadn't put enough effort into this disc through the performing and sequencing, all the mixing and mastering was performed by him as well. And what a job he has done. The album sounds fantastic. In fact, until I had read through the accompanying booklet, I was totally unaware of the sequenced drums. With hindsight I see that they are there, but they are done so meticulously, and sound so realistic, that only the pickiest person would make an issue of them. Actually, speaking of the booklet, believe it or not, it was also designed by Vladimir. I can't praise this album enough. Fans of black metal, death metal, symphonic metal, avant-garde etc etc etc, get this album. It really is that good.